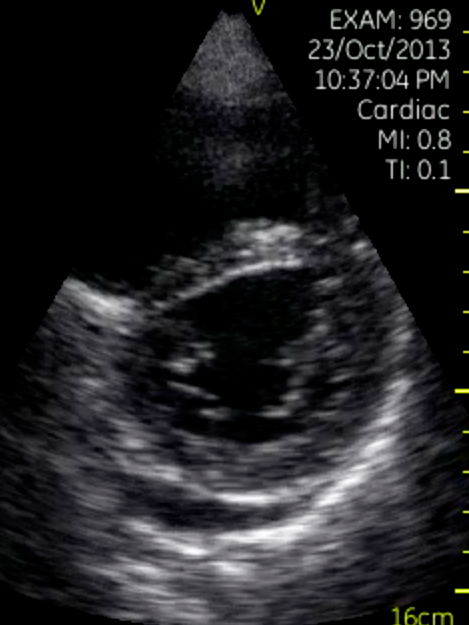 What do you see in this parasternal short axis view, and what are the physiological implications? Scroll below for the answer! This is the “D” sign, aptly named for the D-shape taken by the LV (normally circular) when RV overload occurs and there is paradoxical septal motion and flattening, as early diastolic RV pressure exceeds early diastolic LV pressure. This is NOT a good thing and points to a very strained hemodynamic pattern. Note the RV is huge in this cut, bigger than the LV (remember that in all views, the RV should be about 60% of the LV size – this is simply due to the semi-lunar shape the RV takes as it “wraps” around the LV – they both have the same stroke volume). Also note the small posterior pericardial effusion. So what is the diagnosis here? Well there isn’t enough information to say with just this image. This happens to be a case of worsening ARDS, but all you can tell is that there is acute right ventricular failure due to pressure overload, so that the diagnosis includes (a) PE, (b) acute pulmonary hypertension due to some kind of pulmonary disease – ARDS, pneumonia, etc… Obviously, in the absence of significant parenchymal abnormalities on CXR or B lines/effusions/consolidations on lung ultrasound, PE should be strongly considered.